Omid Djalili – The world’s funniest Iranian stand-up comedian and actor. Omid Djalili is an award-winning British-Iranian actor/comedian. Not only acclaimed as one of Britain’s funniest stand up comedians, he has also featured in films including The Mummy, Gladiator, Spy Game, Modigliani, Sky Captain & The World of Tomorrow, Alien Autopsy, Casanova, Over the Hedge, The Allottment and Pirates of the Caribbean III. Omid has also presented his own show on BBC 1 – The Omid Djalili Show. After great success at the Edinburgh Festivals of 1993 and 1994 with a one-man theatre piece, Omid became a festival favourite with a string of sell-out comedy shows. It started in 1995 with Short Fat Kebab Shop Owner’s Son, then in 1996 in Arab & The Jew and in 1997 with Omid Djalili Is Ethnic. In 1999 he went back to Edinburgh and had another hit show, The Iranian Ceilidh with Kamal Mazlumi. Warm to my Winning Smile then followed in 2000, and in 2002 Behind Enemy Lines. All three of these shows became Edinburgh’s hottest ticket. Behind Enemy Lines received an astonishing six 5-star reviews. In 2005 Omid returned to the festival with his most successful show to date, No Agenda, with record breaking sales on the fringe totalling 16,500; this show then transferred to a total sell-out nationwide 40 date tour, including 2 shows at the London Palladium in 2006. He is one of the funniest, freshest and most original comedians in Britain today. 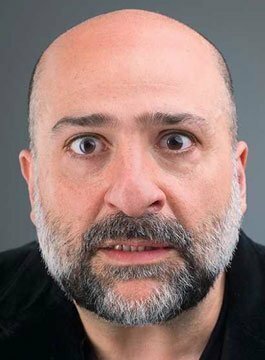 Omid Djalili’s international appeal is vast, having performed in recent years in Australia, Austria, the USA, Canada, Czech Republic, Denmark, Germany, Holland, Sweden, Norway, Switzerland, Slovakia and recently he performed in Qatar for the Emir where he shared a stage with Bill Clinton.